Driving value from contract manufacturers and third-party fulfillment companies fueled investment in innovation. Protecting continuity of supply and consistency of pricing in a volatile global market. Improving end-to-end supply chain cost, cash and growth in a complex, high-tech global industry. Driving TVO by enhancing visibility and control in the procurement function and product mix for a major distributor of nutritional health products. Transforming the supply chain into a competitive weapon for a global chemicals company in a complex post-merger environment. Rapidly improving global operations and supply chain capabilities in a diverse business unit and global environment. Rapidly releasing cash, reducing cost and enabling growth to achieve strategic imperatives and profit goals. A collaborative, TVO™ approach created a win-win-win-win for our client and its key stakeholders. Driving measurable value in a firm that isn't accustomed to working with consultants. Accelerating measurable value, reducing risk and driving successful integration. Building a professional supply chain and operations platform to facilitate rapid growth at a high-tech and electronics manufacturer. Empowering a supplier to the oil & gas industry with the tools to do things differently, better and in a more sustainable way. Delivering same quality product and increased optionality for offshore contract manufacturing. Using operational due diligence and new product introduction to attain value at a leading audio consumer products company. Transforming procurement and introducing a 'guest first' approach at a fast-casual restaurant chain. Combining predictive analytics with procurement expertise to deliver measurable value in commodity procurement for a specialty chemicals company. Driving measurable results, from due diligence to improved competitiveness, for a specialty paper products manufacturer in a low margin, specialized industry. Implementing new operating processes and procedures to improve competitiveness in a highly complex business environment. Revitalizing the workforce and rapidly improving procurement and operations at a major manufacturer of battery technology. Improving EBITDA and increasing throughput for a global manufacturer of advanced magnetic materials and products in a highly unionized environment. Professionalizing procurement and logistics for a specialty chemicals company. Changing the company culture at an omnichannel mail order and electronic retail company led to multimillion-dollar savings. Aligning procurement with product development and operations for enhanced impact in a high tech, high-end market. 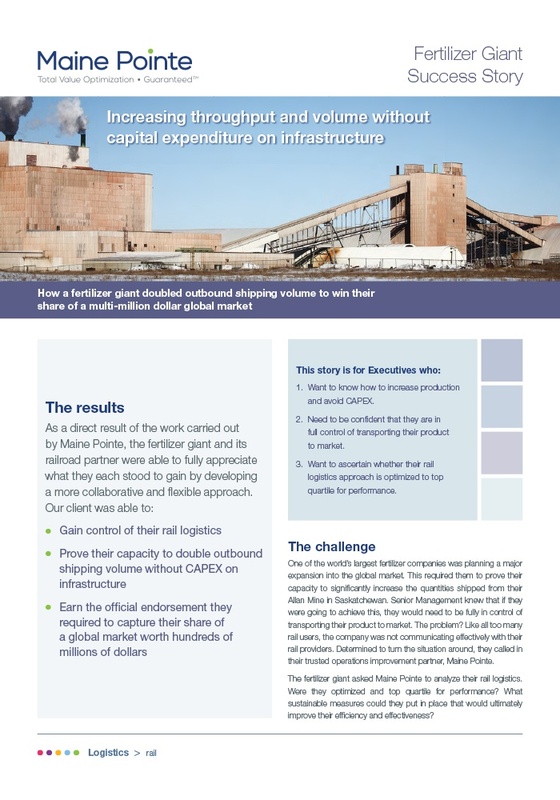 Aligning rail operations helped the world's largest producer of phosphate and potash achive multimillion-dollar savings. 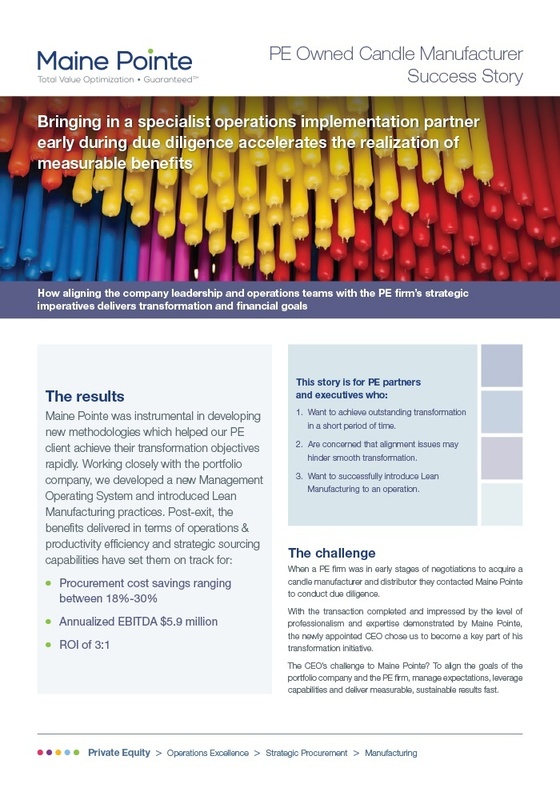 Optimizing procurement to achieve a 20% EBITDA improvement in a limited supplier market. 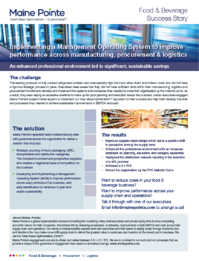 Improving OEE, reducing costs and enhancing customer service for a global food company. Optimizing the supply chain to fuel growth for a leading specialty chemicals company. Hardwiring collaboration across product engineering, procurement, operations and commercial teams to drive productivity and supply chain innovation. Transforming the supply chain to increase revenue and EBITDA for a global industrial goods company. Maine Pointe helped a restaurant and entertainment business with 84 locations across the US and Canada make the shift from transactional to strategic sourcing. Leadership and alignment around change was crucial to helping a specialty materials and specialty chemicals company tap into new commercial markets. Vendor consolidation and process alignment helped a global chemicals company combine two companies into one multibillion-dollar organization. Aligning procurement and stakeholders behind a set of common goals helped a food processor improve communication and break through functional silos. 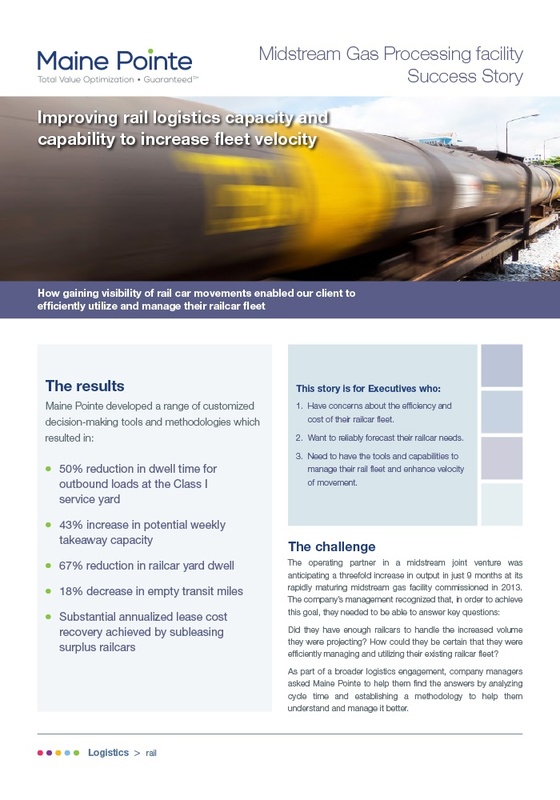 A comprehensive review of their outsourcing strategy helped a Chorovinyls manufacturer increase rail car availability, reduce costs and improve service through insourcing. 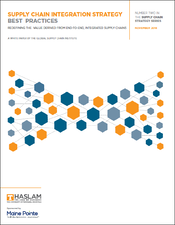 Supply chain disintermediation helped a world-leading food processing and distribution company gain greater control of the price and quality of globally-sourced goods. Our PE experts helped stand up a carve out for a multinational business in a very short period of time. Our Total Value Optimization™ approach helped a major chemicals company take their high-performance operations and procurement to the next level. We helped a home décor company integrate a single, homogenous strategic procurement organization across five business units while improving EBITDA and cash. We helped a North American Crop Nutrient & Ingredients producer improve its logistics and develop its first ever international strategic procurement function. We helped a manufacturing company build a consistent and professional management capability and quality system to facilitate growth. Improving product time-to-market, quality and supplier optionality while reducing costs. Maine Pointe helped an apparel manufacturer and marketer put in place a structure to onboard new suppliers, qualify and build supplier optionality while improving their competitive position. Breaking through functional and cultural barriers to help a specialty equipment manufacturer and service provider drive sustainable change. Breaking down silos by simultaneously addressing procurement and operations functions. 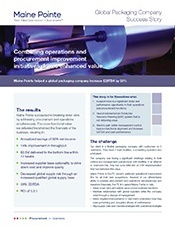 We helped a global packaging company to transform its financials. 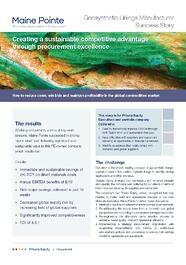 Creating a sustainable competitive advantage through procurement excellence. Maine Pointe helped a leading geosynthetic lining manufacturer to increase the field of global suppliers, improve competitiveness and rebuild damaged customer-supplier relationships. Post-acquisition alignment and accelerated transformation for a PE firm’s portfolio company. Maine Pointe was challenged with aligning company leadership and operations teams with the PE firm’s strategic objectives and delivering on transformation and financial goals. 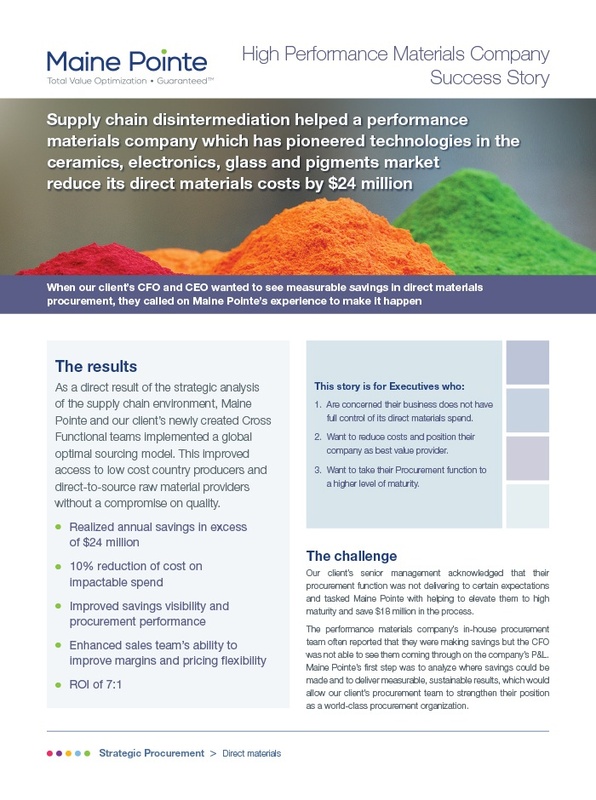 Reducing direct materials spend for a performance materials company. Maine Pointe helped our client bring down direct materials costs and strengthen their position as a world-class procurement organization. 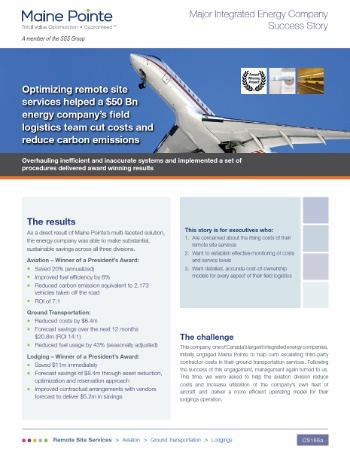 Aviation field services optimization for a $50bn integrated energy company. In this award-winning engagement, Maine Pointe was tasked with optimizing our client’s own-fleet utilization to reduce costs while maintaining quality of service. 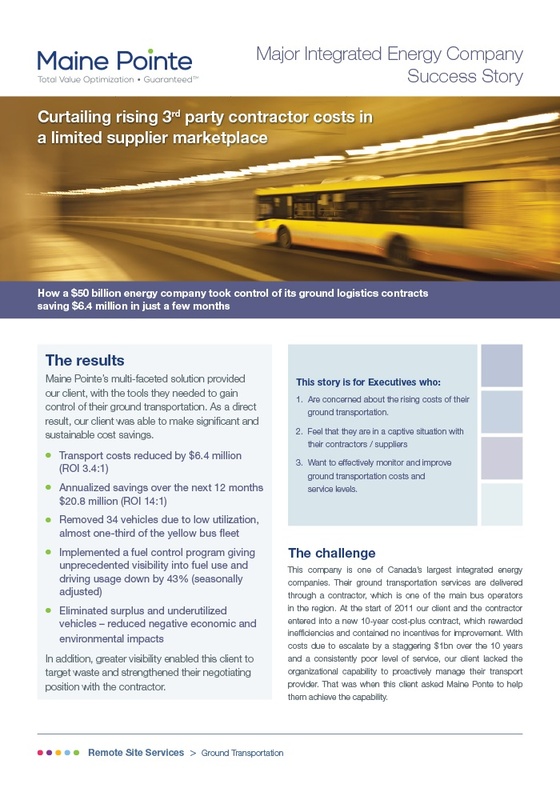 Reducing ground transportation costs for a major integrated energy provider. Maine Pointe delivered the organizational capability our client needed to to proactively manage their 3rd party transport provider. Identifying and closing the gaps in a scheduled turn around for a petroleum producer. 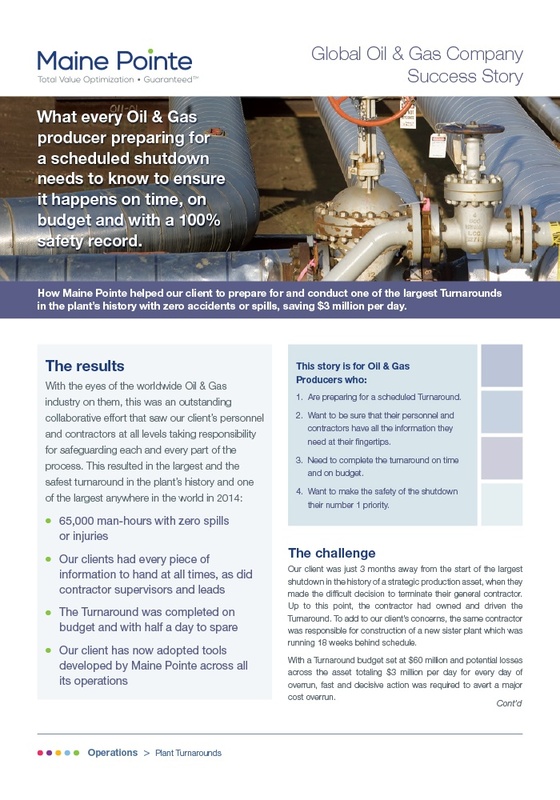 Maine Pointe ensured that the largest turnaround in our client's history was completed on time, on budget and with zero accidents or injuries. Increasing rail logistics capacity for a producer of fertilizer, industrial and animal food. Maine Pointe helped our client develop an optimized rail distribution network capable of supporting their plans to significantly increase capacity. Optimized utilization and allocation of lodgings for a major integrated energy company. 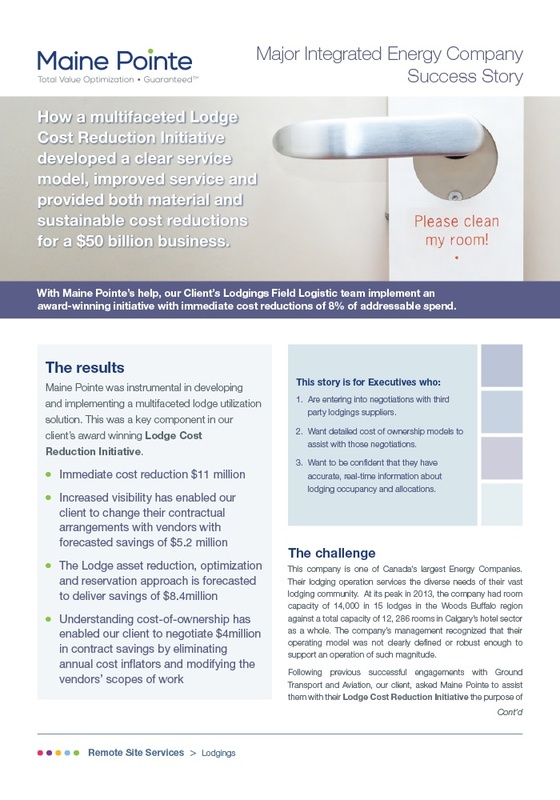 In an award-winning engagement Maine Pointe developed and implemented a robust operating model for our client’s lodging operation services. Optimized remote site services for a leading energy company. 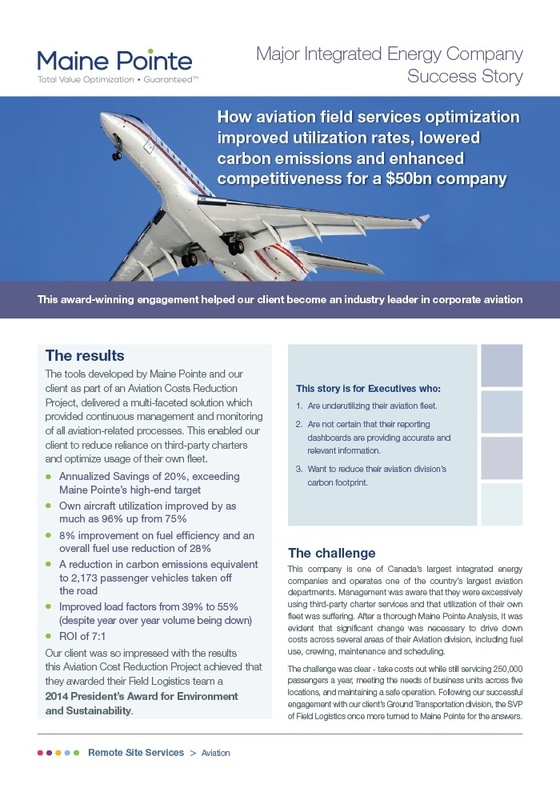 Maine Pointe delivered better control, greater accuracy and increased visibility in our client’s aviation, ground transportation and lodgings divisions. 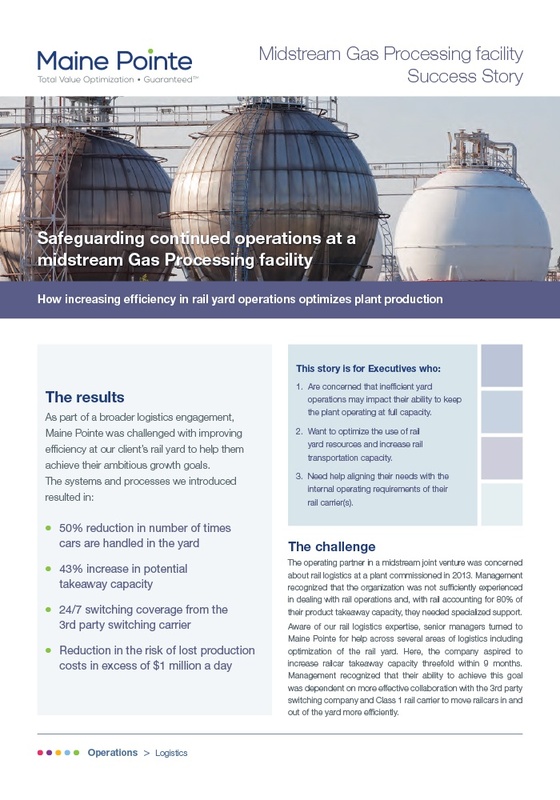 Increased rail yard efficiency at a midstream Gas Processing facility. Maine Pointe helped the client to build strong working partnerships and optimize the staging process. 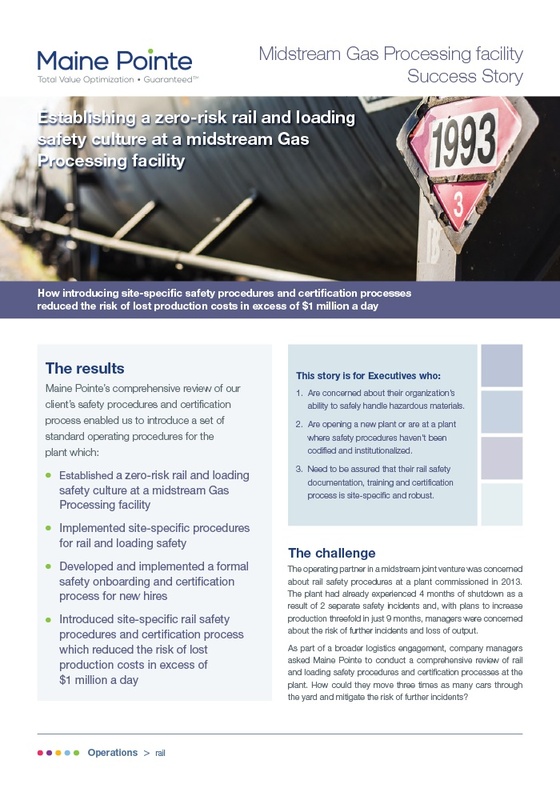 Enhancing logistics efficiencies and safety procedures at a midstream Gas Processing facility. Maine Pointe helped the client develop the capacity to safely and efficiently meet the demands of a threefold increase in production. Improving rail logistics and increasing fleet velocity at a midstream Gas Processing facility. Maine Pointe gave our client the specialized tools to manage their rail fleet and enhance velocity of movement. 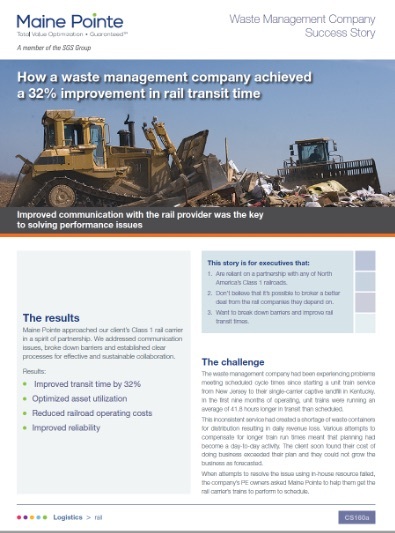 Improving rail transit times and optimizing asset utilization for a waste management company. Maine Pointe strengthened the relationship between our client and their Class 1 rail carrier. Upskilling the procurement function at a drive-thru restaurant chain. The systems and processes we introduced delivered sustainable savings. Implementing a new Management Operating System for a producer of fully-cooked entrees improved performance across procurement, operations and logistics. 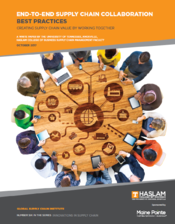 Helping a leading manufacturing company transform its procurement team through knowledge transfer and leadership.